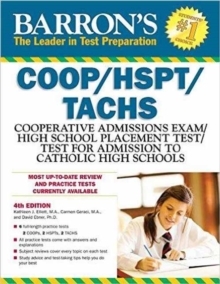 The COOP and HSPT tests are entrance exams given to students applying for admission to most Catholic high schools across the country. In the Archdiocese of New York, student applicants take a slightly different test called the TACHS. This test preparation manual offers: A detailed introduction that thoroughly explains the format of each of these exams and provides test-taking tips and advice Updated general subject reviews with questions and answer explanations covering math, verbal skills, language arts, and reading comprehensionTwo practice COOPs, two practice HSPTs, and two practice TACHS tests that reflect the most recent examsEvery practice test comes with answers and explanations.